Let the Romanian Blouse of Matisse inspire you. Henri Matisse (1869-1954), a famous French painter known for his bright and intense colours, was fascinated by the Romanian folk costumes, especially by the specific blouses named "ie". Starting from 1940 he created a series of paintings with women dressed in Romanian blouses. The canvas must have been discussed with his friend, the Romanian painter Theodor Pallady (1871-1956). Their friendship went back to the time they were both studying at the Ecole des Beaux Art in Paris. In his correspondence, Matisse would accompany his letters by sketches and would use Pallady as a sounding board. In this context, the theme of the Romanian blouse becomes more significant. Painted in 1940, the darkest period during the 2nd WW, the use of the bright colours was as an antidote. Let us get inspired by his paintings, or even better let us get inspired by the Romanian tradition. As more as I study the Romanian tradition: folk costumes, ceramics, interiors, the more I discover how much Romania has to offer. For years the Romanians were not interested in their heritage, they wanted to forget about the old times and were welcoming modern styles with open arms, throwing out through the back door all what belonged to their parents and grand-parents. But slowly I see a change: specially younger people are curious about their heritage. Young designers using the traditional elements in a new way and selling all-over the world. It is time to get proud again of what they have. 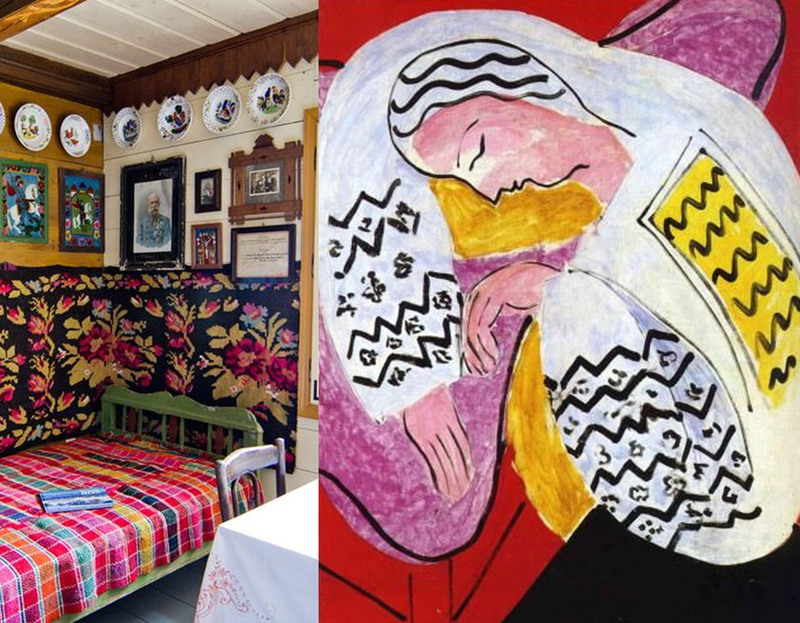 So let Matisse inspire us to decorate our home on the country side. If we start renovating a small house on the countryside than it is important not to over-decorate. The rooms in general are small, the ceiling not to heigh: so keep the walls white or very light. If starting to build your country house than you can make the rooms more spacious and add the typical character by using wooden beams for the ceiling, try to finish the walls in a more natural and traditional way. A lot of white with added colour splashes. Mix-and-match patterns as we have seen them in the old houses: combination of big flowers, stripes, checks, all in bright colours. Often the country house is the weekend house. It is the time to relax and get away from all the hectic of the daily routine. All you need is a few comfortable pieces in the house, you could get inspired by the minimalist philosophy, but in a more relaxed and a bit more rustic way. Taking the elements from the nature around in the house will feel very natural. Rustic wood on the walls, painted white, in contrast with some natural wood and again the colour elements. Combine contemporary furniture and traditional elements to give it a modern look. We know Matisse also for his use of very simple and stylised shapes: the Cut Outs. This could be an inspiration for the curtains, or a stencilled decoration on the walls. Often I've seen those barns on the country side and they make me dream of having an art studio inside. You will have the high ceiling to give you space. When opening one of the walls and adding a big window all the natural light will flow inside. A table, a chair .... what do you need more as your creative work will soon decorate the walls. The bathroom can be very simple, travertine stone on the floor, walls finished with a tadelakt to give them a more hand-finish and "human" touch. Heavy linen bath linen with a jacquard border, some wood elements and the look will be perfect if you could find some old tiles to cover a part of the wall. Don't forget the beauty is in the imperfection.